1 A None No Power Seat 1 A is a standard Europe Business seat. The tray table is in the armrest, making the armrest immovable and slightly reducing seat width. There is no floor storage during takeoff and landing. The proximity to the galley and lavatory may be bothersome. 1 C None No Power Seat 1 C have restricted legroom due to the position of the Bulkhead. The tray tables are in the armrests, making the armrests immovable and slightly reducing seat width. 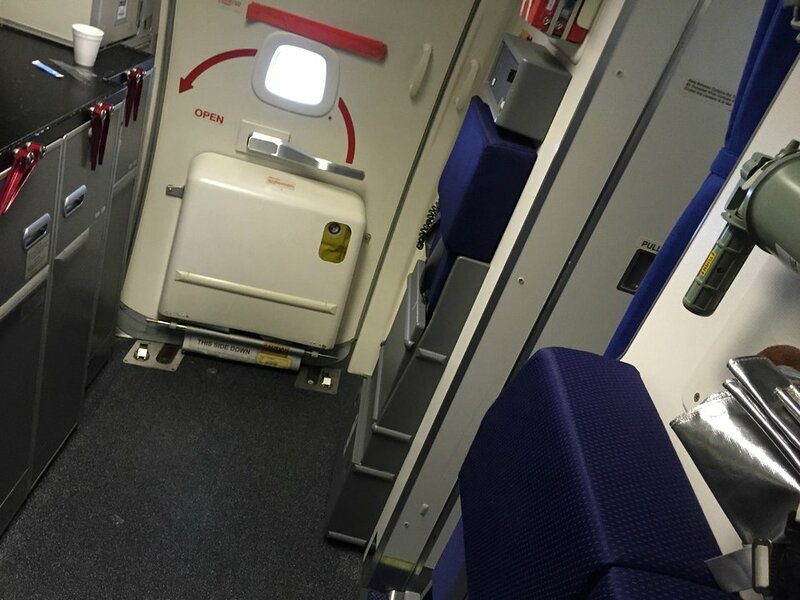 There is no floor storage for these seats during take-off or landing. The close proximity to the galley and lavatory may be bothersome. 1 D None No Power Seat 1 D have restricted legroom due to the position of the Bulkhead. The tray tables are in the armrests, making the armrests immovable and slightly reducing seat width. There is no floor storage for these seats during take-off or landing. The close proximity to the galley and lavatory may be bothersome. 1 F None No Power Seat 1 F is a standard Europe Business seat. The tray table is in the armrest, making the armrest immovable and slightly reducing seat width. There is no floor storage during takeoff and landing. The proximity to the galley and lavatory may be bothersome. 10 A None No Power Seat 10 A is a standard Economy Class seat that does not recline due to the exit row behind. This seat also has limited under-seat leg and storage room due to the presence of an electronics equipment box. 10 B None No Power Seat 10 B is a standard Economy Class seat that does not recline due to the exit row behind. 10 C None No Power Seat 10 C is a standard Economy Class seat that does not recline due to the exit row behind. 10 D None No Power Seat 10 D is a standard Economy Class seat that does not recline due to the exit row behind. 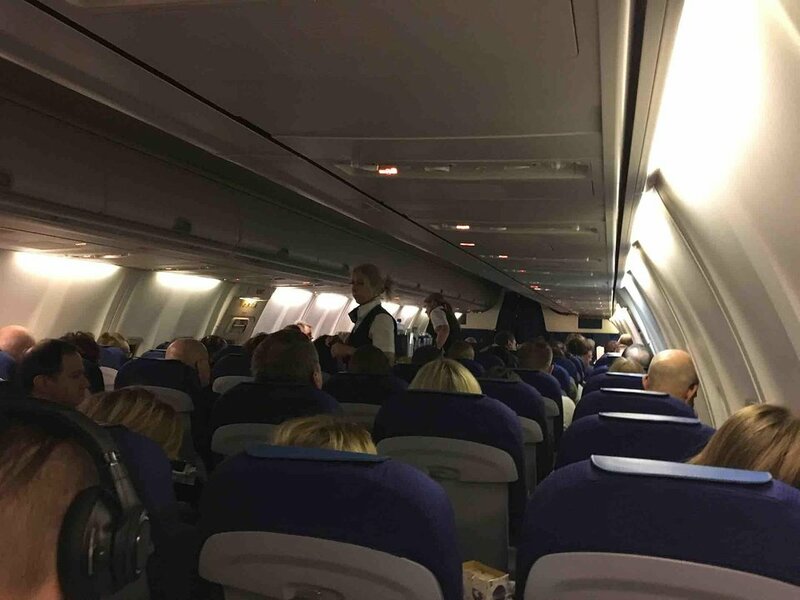 10 E None No Power Seat 10 E is a standard Economy Class seat that does not recline due to the exit row behind. 10 F None No Power Seat 10 F is a standard Economy Class seat that does not recline due to the exit row behind. 11 B None No Power Seat 11 B is a standard Economy Class seat that has additional legroom due to the exit row, however, it has limited recline. There is no floor storage for this seat during take-off and landing. 11 C None No Power Seat 11 C is a standard Economy Class seat that has additional legroom due to the exit row, however, it has limited recline. There is no floor storage for this seat during take-off and landing. 11 D None No Power Seat 11 D is a standard Economy Class seat that has additional legroom due to the exit row, however, it has limited recline. There is no floor storage for this seat during take-off and landing. 11 E None No Power Seat 11 E is a standard Economy Class seat that has additional legroom due to the exit row, however, it has limited recline. There is no floor storage for this seat during take-off and landing. 14 A None No Power Seat 14 A is an Economy Class seat which has limited under-seat leg and storage room due to the presence of an electronics equipment box. 15 A None No Power Seat 15 A is an Economy Class seat which has limited under-seat leg and storage room due to the presence of an electronics equipment box. 16 A None No Power Seat 16 A is an Economy Class seat which has limited under-seat leg and storage room due to the presence of an electronics equipment box. 17 A None No Power Seat 17 A is an Economy Class seat which has limited under-seat leg and storage room due to the presence of an electronics equipment box. 18 A None No Power Seat 18 A is an Economy Class seat which has limited under-seat leg and storage room due to the presence of an electronics equipment box. 19 A None No Power Seat 19 A is an Economy Class seat which has limited under-seat leg and storage room due to the presence of an electronics equipment box. 2 A None No Power Seat 2 A is a Europe Business seat which has limited under-seat leg and storage room due to the presence of an electronics equipment box. 2 C None No Power Seat2 C is a standard Europe Business seat. 2 D None No Power Seat2 D is a standard Europe Business seat. 2 F None No Power Seat2 F is a standard Europe Business seat. 20 A None No Power Seat 20 A is an Economy Class seat which has limited under-seat leg and storage room due to the presence of an electronics equipment box. 21 A None No Power Seat 21 A is an Economy Class seat which has limited under-seat leg and storage room due to the presence of an electronics equipment box. 22 A None No Power Seat 22 A is an Economy Class seat which has limited under-seat leg and storage room due to the presence of an electronics equipment box. 23 A None No Power Seat 23 A is an Economy Class seat which has limited under-seat leg and storage room due to the presence of an electronics equipment box. 24 A None No Power Seat 24 A is an Economy Class seat which has limited under-seat leg and storage room due to the presence of an electronics equipment box. 25 A None No Power Seat 25 A is an Economy Class seat that may have limited recline. The proximity to the lavatories and galley may be bothersome. This seat also has limited under-seat leg and storage room due to the presence of an electronics equipment box. 25 B None No Power Seat 25 B is an Economy Class seat that may have limited recline. The proximity to the lavatories and galley may be bothersome. 25 C None No Power Seat 25 C is an Economy Class seat that may have limited recline. The proximity to the lavatories and galley may be bothersome. 25 D None No Power Seat 25 D is an Economy Class seat that may have limited recline. The proximity to the lavatories and galley may be bothersome. 25 E None No Power Seat 25 E is an Economy Class seat that may have limited recline. The proximity to the lavatories and galley may be bothersome. 25 F None No Power Seat 25 F is an Economy Class seat that may have limited recline. The proximity to the lavatories and galley may be bothersome. 3 A None No Power Seat 3 A is a Europe Business seat which has limited under-seat leg and storage room due to the presence of an electronics equipment box. 3 C None No Power Seat3 C is a standard Europe Business seat. 3 D None No Power Seat3 D is a standard Europe Business seat. 3 F None No Power Seat3 F is a standard Europe Business seat. 4 A None No Power Seat 4 A is a Europe Business seat which has limited under-seat leg and storage room due to the presence of an electronics equipment box. 4 C None No Power Seat4 C is a standard Europe Business seat. 4 D None No Power Seat4 D is a standard Europe Business seat. 4 F None No Power Seat4 F is a standard Europe Business seat. 5 A None No Power Seat 5 A is a Europe Business seat which has limited under-seat leg and storage room due to the presence of an electronics equipment box. 5 C None No Power Seat5 C is a standard Europe Business seat. 5 D None No Power Seat5 D is a standard Europe Business seat. 5 F None No Power Seat5 F is a standard Europe Business seat. 6 A None No Power Seat 6 A is a standard Economy Comfort seat. 6 B None No Power Seat 6 B is a standard Economy Comfort seat. 6 C None No Power Seat 6 C is a standard Economy Comfort seat. 6 D None No Power Seat 6 D is a standard Economy Comfort seat. 6 E None No Power Seat 6 E is a standard Economy Comfort seat. 6 F None No Power Seat 6 F is a standard Economy Comfort seat. 7 A None No Power Seat 7 A is an Economy Class seat with a misaligned window and limited under-seat leg and storage room due to the presence of an electronics equipment box. 7 F None No Power Seat 7 F is a standard Economy Class seat with a misaligned window. 8 A None No Power Seat 8 A is an Economy Class seat which has limited under-seat leg and storage room due to the presence of an electronics equipment box. Each Europe Select seat is equipped with a 110V AC power port. KLM offers prepared sandwiches for breakfast, lunch, and dinner, as well as a variety of complimentary beverages. 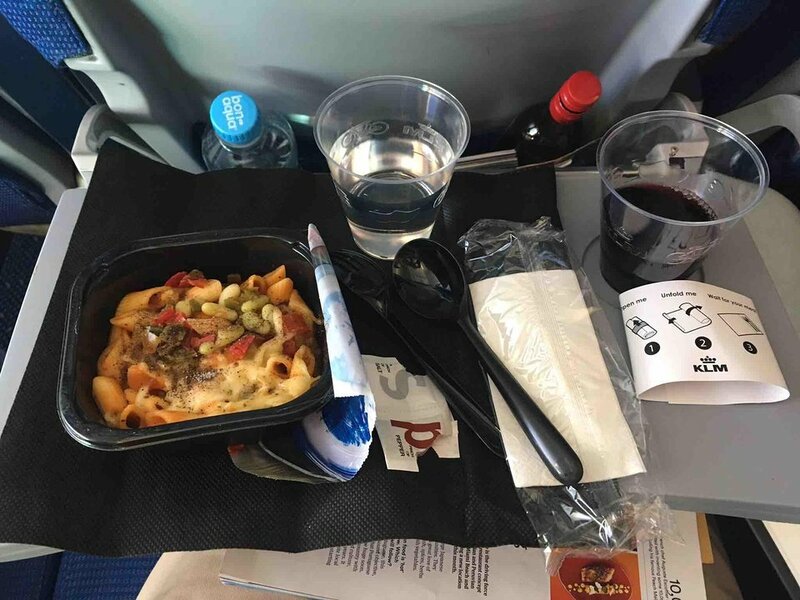 Europe Select passengers receive full meal service on board (hot or cold meals depend on the length of the flight). 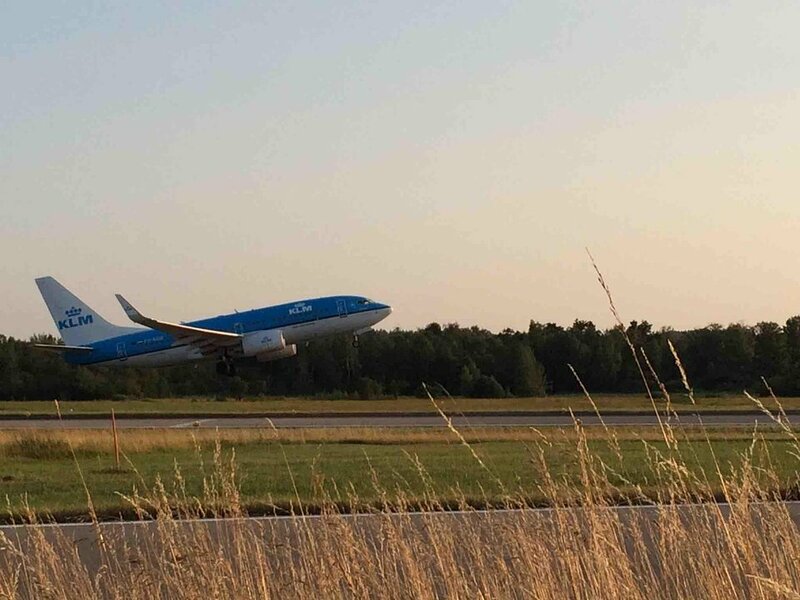 KLM's Europe Business seats come with flexible booking, advance seat reservation, extra baggage allowance, priority boarding and disembarking, and a quick passage through customs. Plus, you earn double Flying Blue Miles with every flight in a Europe Business seat. For this flight rows 3-6 were economy comfort seats. But only row 3-5 offer the same legroom as row 1&2, which is business class. Row 6 is also listed as economy comfort, but seemed to have significant less legroom than row 1-5. Also in 2F,3F,4F and 5F there is presence of an electronics box, same as on the A seats. I am 5ft 8" and slightly round ;) but I found the seat pitch brilliant. I had no trouble stretching my legs and was not uncomfortable for a short haul flight. Seat width yes is narrow but it is for a short haul flight so 17" is adequate for the journey. Was better when we lifted the arm rest so me and my partner had a little more space. 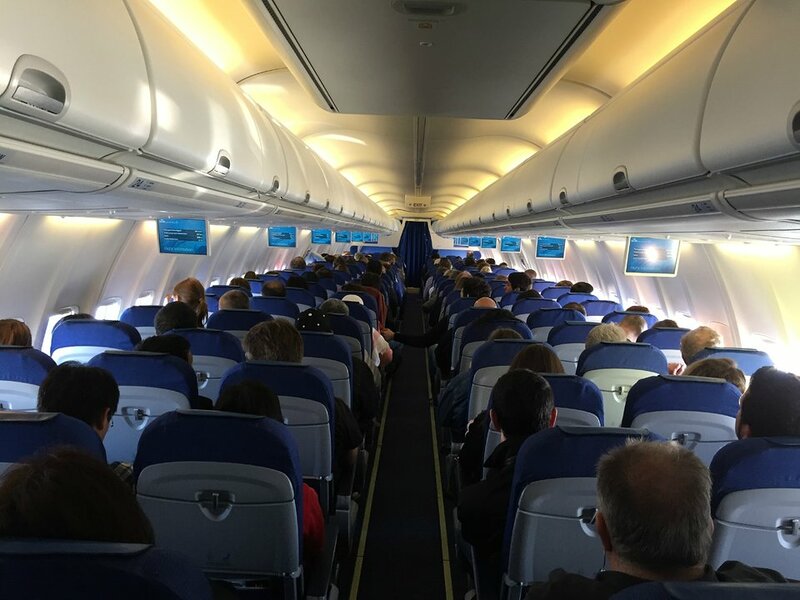 KLM flies 1 versions of Boeing 737-700.